Although there are many things about the holidays that bring a lot of joy, other aspects of this season can be a trigger for stress. Whether it’s simply trying to get through a to-do list that’s noticeably longer than during other times of the year or something like travel, you’re not alone if stress comes up during the next couple of months. In addition to being an issue that other people have to face, it can also impact pets. Even though pets don’t understand the concept of Thanksgiving or Christmas, anyone who has an animal knows just how much they can pick up on about their environment. So as the holiday season hits full swing and things like your schedule get more hectic, these changes can give your pet feelings of anxiety. And during the times when you’re personally stressed, your pet may pick up on those feelings and experience them as well. 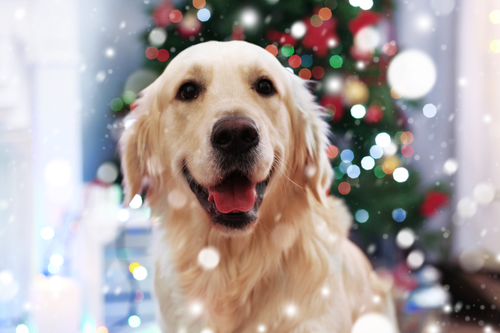 Since you want your pet to be able to enjoy this special time of the year and not be plagued by an issue like stress, we want to cover specific things that may trigger a pet, along with proven solutions for reducing or even eliminating holiday stress. While there are some unique situations or things that may trigger stress in a pet during this time of year, most of the stress pets experience can be linked to one of two specific things. The first is noise. Whether or not we notice it, all the increased activity that goes along with this time of year can mean a lot more noise around the house. If that isn’t something your pet likes, the result can be an increase in stress. The other issue that can really stress out a pet is having new people in your house. This can be just as true for people stopping by for a holiday meal as it is for guests who are staying with you for a few days. If you’re worried that you’re going to have to choose between holiday hosting or stressing out your pet, keep reading to learn how to help your pet even when people are over. We have three proven solutions that help combat both of the stress triggers we covered above. If your pet doesn’t already have a dedicated space in a quiet part of your home, creating it is the first step to combatting stress. Second, be sure to make exercise a priority throughout the holidays. That means getting outside with your dog and making a point of playing with new toys with your cat. Finally, our calming balm is specifically designed to keep dogs calm when they’re facing situations that may be stressful. The balm is made locally with all-natural ingredients and doTERRA oils. It’s safe for humans to use as well, so you can even try it out on yourself!